WBO super bantamweight champion Nonito “The Filipino Flash’ Donaire is slowly but surely earning the distinction of beating champions and sending them into retirement. The latest is former WBC super-bantamweight champion Toshiaki Nishioka who announced his retirement one month after losing to Donaire by a 9th round TKO at the Home Depot Center in Carson City, California. Donaire dropped the WBC super champion with a perfectly-timed uppercut in round six and then a cracking right in round nine and although Nishioka beat the count he was clearly in no position to continue and distinguished international referee Raul Caiz Sr waved it off at 1:54 of the round. At the time of the stoppage Donaire was well ahead on the scorecards of all three judges. Ralph McKnight and Carlos Ortiz Jr had Donaire ahead 79-72 while Fritz Werner had the Filipino winning by an 80-71 shutout. The first fighter to retire after taking a bad beating from the flashy Filipino was former WBA bantamweight champion Volodymyr Sydorenko of the Ukraine who was bloodied and battered by Donaire who had warned Sydorenko that he was putting himself in “Harm’s Way” when he entered the ring to face-off against him in a battle for the WBC Continental Americas bantamweight title at the Honda Center in Anaheim, California on December 4, 2010. yesterday. Sidorenko soon realized the warning was real as Donaire battered and bloodied the Ukraine boxer dropping him three times in four rounds to score a brutal knockout victory. Donaire who said he “never felt better” and was “eager to put on an impressive showing” against the tough Ukraine fighter who won a bronze medal in the Sydney, Australia 2000 Olympic Games, more than accomplished the task. Donaire conceded that Sidorenko was a tough opponent but that he wanted to make a statement to reigning WBC/WBO champion Fernando Montiel by knocking him out for the first time in his career, began his task in the very first round. 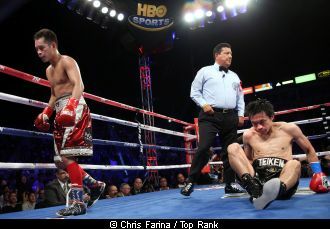 Donaire dropped the former world champion with a numbing right hook that saw him stagger towards the referee in serious trouble before being saved by the bell. Working behind a stinging jab and demonstrating his remarkable hand-speed and movement, Donaire bided his time but hurt Sidorenko with some solid punches to take control of the fight by the end of round two. Donaire reprised the devastating counter left hook that demolished cocky Vic Drachinyan on July 7, 2007 to send Sidorenko crashing to the canvas for the second time in the fight. Continuing to move in and out and cracking Sidorenko from different angles using his speed very much in the style of his idol and Filipino hero Manny Pacquiao, Donaire bloodied the face of the Ukraine fighter who was making his first appearance in the United States. A cool and methodical Donaire gradually ripped Sidorenko turning his face into a grotesque mass of blood before an explosive combination dropped him for the third time with the referee having no hesitation in calling it off at 1:48 of the fourth round as Sidorenko, with blood pouring out of his nostrils and his face all cut up was clearly in no position to continue. While Nishioka didn’t receive the kind of punishment that Sydorenko suffered, he was totally out-boxed by the skilful Donaire who is ranked No. 4 in the Ring Magazine pound for pound list. Nishioka paid tribute to Donaire when he said “ I am confident of becoming champion again if I fight boxers other than Donaire. "But I cannot think of any better fight than the one I had with him." The classy 36 year old Japanese southpaw said "I have done what I should do. I am fully satisfied with my boxing career.I have experienced excitement many times through 18 years as a pro boxer." Nishioka, nicknamed "Speed King" for his fast-paced fighting style and feared for his devastating straight left, made his professional debut in 1994 and became WBC super-bantamweight champion in 2008. In his last fight prior to facing Donaire Nishioka made his successful seventh defense of his title scoring a rousing win over tough beat Mexican Rafael Marquez in Las Vegas last December. He was named WBC "emeritus champion" on March 15, leaving the regular title vacant which was won by Mexico's Abner Mares on April 21 when he beat Puerto Rican Eric Morel in El Paso, Texas. In a reaction to Nishioka’s retirement Donaire said in a statement he felt proud to have fought a "speedy and brainy boxer" such as Nishioka and sent his best wishes to the Japanese fighter.